Home/Central banks, China, English, Financial crisis, Global economy, Zombie companies/The world economy: The way of Japan? Some have started to speculate that the world economy will follow the “Way of Japan”. By this they mean that central bankers will take an active (in practice, permanent) role in the financial markets. The hope is that this would keep the global asset bubble inflated and the world economy going. However, what Japan did in the 1990’s (and after) is unlikely to work on a global scale. Moreover, the global economy has already been going the “Way of Japan” for some time. More of the same will just make the global economy even more fragile. Here we detail, based on academic research, the failure of the Japanese economic miracle and explain why the world economy has already ‘Japanified’. We also explain why there’s no easy Japan-style fix to global economic problems. After the Second World War, Japan was in ruins. 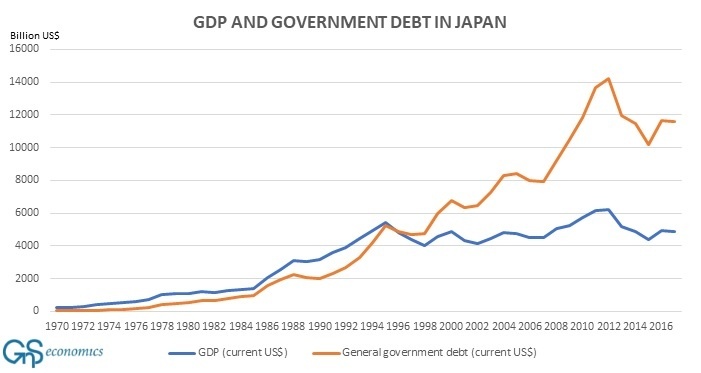 Soon, however, reconstruction, financial repression (that kept nominal rates artificially low) and pro-business and education reforms propelled the Japanese economy to a multi-decade boom. Following a global trend, government began to deregulate the financial sector in the 1980s. In the latter part of the 1980’s, the Bank of Japan (“BoJ”) tried to limit the appreciation of the yen via “sterilization” of their trade surpluses. These actions led to rapid growth in domestic supplies of money and credit, which in turn led to a very high growth rate in the prices of real estate and stocks, where bubbles formed. At the peak, for example, the value of Japanese real estate was double of that in the US. Banks held large volumes of real estate and stocks which were used as collateral for loans. Industrial firms bought real estate because such investment was much more profitable than, for example, producing steel and automobiles. In the mid-1989, the BoJ started to raise interest rates in an effort to prick the asset bubbles. The stock market peaked on the last trading day of 1989. The long bear market that followed bottomed-out only in the spring of 2003 after a fall of close to 80 percent. The fall in real estate prices was slower, but just as disastrous. Because the collateral of the banking sector was tightly connected to real estate, its value collapsed as well. Many industrial firms suffered crippling losses from their investments in real estate. The collapse of the stock market wiped out a large portion of the capital of banks, which, combined with declining collateral, forced the banking sector into widespread insolvency. Faced with an overwhelming crisis, the Japanese government and the Bank of Japan enacted massive bailout programs. The BoJ started to reduce its target interest rate in 1991, which eventually reached zero in 2001. When the crisis intensified in 1993/1994, it started to act as lender of last resort, and also bailed-out several large financial institutions. In 2001, the BoJ enacted Quantitative Easing Policy (”QEP”), a forefather of the Quantitative Easing, or QE. The Japanese government subsidized firms to maintain employment and banks were allowed to carry non-performing loans on their books without any demands on borrowers to restructure their businesses. Government policies permitted the use of accounting gimmicks, which allowed bank supervisors to implement policies that enabled banks to understate their loan losses and overstate their capital. Moreover, facing widespread public anger over bank bailouts, the government allowed, and in some cases even encouraged, banks to extend loans to ailing businesses (“evergreening”). Faced with an unpleasant alternative, the banks were more than happy to comply. Ailing banks supported ailing companies to prevent the losses that their bankruptcy would incur. The Japanese economy ‘zombified’. Because banks extended loans increasingly to unproductive companies, this led to misallocation of credit on a massive scale resulting in a fall in the investment rate and a prolonged slump in total factor productivity. The Japanese economy stagnated. The high standards of living maintained since have been achieved by increasing the debt load of the government (see the Figure). Follow the leader (into the Abyss)? During and after the financial crash of 2008, almost all major banks, and even some major corporations, were bailed-out globally. Many banks, especially in the Eurozone, were allowed to carry non-performing loans and other unprofitable assets in their balance sheets, like in Japan. After 2008 central bankers have also been fighting aggressively against global deflation. They have dropped interest rates to zero and provided massive impulses of liquidity to the markets through QE programs, just as the BoJ did. These ‘unorthodox measures’ have created zombified banks and companies. They have diverted money (credit) from new and more productive firms resulting in stagnating productivity growth, as in Japan. So, in actuality, the global economy has already been on the “Way of Japan” since 2008. When Japan instituted its bailout and monetary experiments in the 1990s, the global economy was growing. Global growth provided crucial support to the Japanese economy through exports. The economy stagnated, but it did not collapse. Now, if China does not perform a similar role and rescue the world economy, yet again, with even more excessive debt stimulus—which seems unlikely—a global recession would commence probably in the latter part of the year. In a recession, additional massive QE might provide support for asset markets, but even so it would not fix the fragile global economy—to the contrary. Only central bank-supported fiscal spending, that is, direct monetization of government debt could provide the necessary stimulus, but this invariably leads to severe inflations. Alas, the global economy will face a stark choice between depression, systemic meltdown or a hyperinflation. Very few understand (much less believe) this yet, but that’s the road we’re on. It’s time to start thinking what to do when the road ends. Buy the full report describing the mechanism of ’Japanification’, the rise of zombie corporations and a detailed explanation why the world economy never recovered from the 2008 crisis. The report also includes economic growth and crisis probability forecasts. By Tuomas Malinen| 2019-03-22T13:40:33+03:00	maaliskuu 18th, 2019|Central banks, China, English, Financial crisis, Global economy, Zombie companies|Kommentit pois päältä artikkelissa The world economy: The way of Japan?